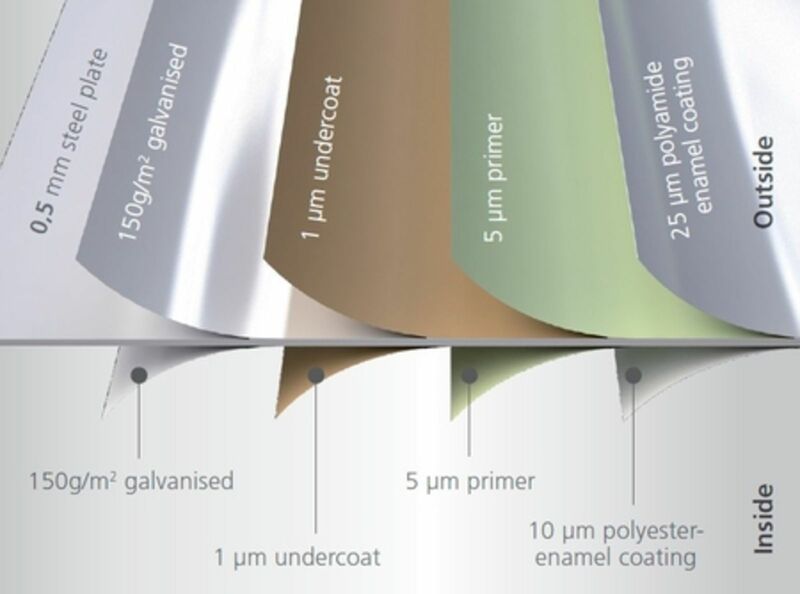 All Biohort metal products are made from hot-dipped galvanised steel plate which have a zinc coating of between 150 g/m² to 275 g/m². Furthermore all the sidewalls and roof panels of Biohort products are protected inside and out by a polyamide coating which has a minimum thickness of between 10 to 25 µm. Biohort uses high quality steel plate supplied by the Voestalpine Group Steel Division Linz, Austria. The Voestalpine Group Steel Division is an internationally renowned producer of high quality steel. Many automobile manufacturers, e.g. the German top-range manufacturers: BMW, Audi and Mercedes, rely on the outstanding quality of steel produced by Voestalpine Group Steel Division in Austria for the construction of the bodywork of their cars. Cheap discounters use screws and plates made of electro-plated metal which, after a few years exposed to the elements begin to show signs of corrosion and damage. Here at Biohort we are uncompromising with regard to quality! All the metal parts of our products are hot-dipped galvanized (we use a very thick protective layer of zinc) and all attaching parts i.e. : nuts, bolts, screws and fittings are made of high-quality stainless steel.